A captivating journey into a beautiful, atmospheric wilderness, with a touching story that doesnt always hit the right notes. What is it? A first-person adventure game about a fire watchman. Shoshone National Forest in Wyoming is a picturesque 2.5 million acre expanse of forests, canyons, lakes, mountains, and rivers. Over 60% of this rugged, alluring landscape is covered in fir, pine, and spruce trees, which makes the area prone to wildfires. And as a newly hired fire watchman at Two Forks Lookout, it’s your job to spot these fires, report them, and stop them spreading. It’s a lonely job in a lonely place, but that’s exactly what you wanted. 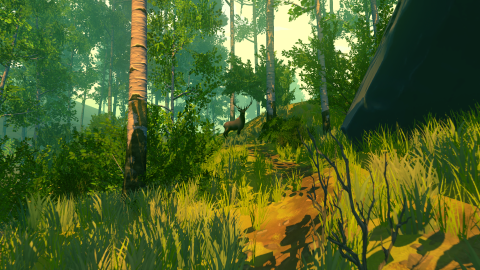 Henry, the protagonist of Firewatch, is running away. People who take jobs like this usually are. Some people flee to Antarctica—the subject of Werner Herzog documentary Encounters at the End of the World—while others, like our hero, prefer the vast, forested wildernesses of North America. I won’t say what he’s escaping from, because it’s better if you find out yourself, but it’s enough to make a man in his forties leave the world behind and hike for two days into the middle of nowhere. After a long trek through the woods, you finally reach the tower. As you enter, a walkie-talkie crackles to life and a warm, dulcet voice urges you to pick it up. This is Delilah, a fellow lookout who introduces herself by brazenly, and slightly mischievously, asking what happened in your life that made you want to take a job all the way out here. Exhausted from the trip and caught off guard by her probing, you avoid the question and go to sleep. Tomorrow, your new life begins. Delilah apologies the next day, and a friendship begins to bloom. The relationship is playful and a joy to eavesdrop on. As you wander the wilderness and investigate, among other things, plumes of smoke and a couple of rowdy teenagers setting off fireworks, you can point at something—a landmark, an lost backpack, a cave, whatever—and bring up the walkie-talkie to ask her about it. She knows the area well, revealing its history and pointing you in the right direction if you get lost. These early moments, hiking through the serene forests and valleys of the Shoshone, talking to Delilah, listening to the wind blowing through the trees, are beautifully peaceful. A map and compass let you do some basic orienteering, and although your location is shown on the map, there’s an option to disable it if you’d rather do things the old-fashioned way. It’s a gorgeous place to explore, with a rich, colourful art style and a vivid sense of place. And careful, measured pacing means you can amble at your leisure without worrying too much about objectives or time limits. The world is mostly open from the start, meaning you can wander off the beaten path and ignore your objective if you want. Some areas are locked until you find certain equipment—like pitons to wedge into rocks and anchor ropes to—but for the most part you’re free to wander. Environmental details bring your surroundings to life and give them a sense of history, from old lookout towers and rusting snowmobiles abandoned in winter, to the remains of a summer camp. Over time you get better at finding your way around, using landmarks to orient yourself without needing the map. A stylish, minimal soundtrack by Gone Home composer Chris Remo uses sparse layers of electric guitar and bass to give weight to important moments, but most of the time all you can hear is the sound of nature around you: trickling streams, rustling leaves, the quiet howl of the wind, squawking birds. This limited use of scoring makes the times when the music does come in more special, because you know its arrival heralds something emotional, dramatic, or revelatory. And although you’re almost always in conversation with Delilah, there are some sections of quiet where you can enjoy the game’s excellent environmental audio design. There are some problems to overcome in the wilds, like abseiling down shale slides with climbing ropes, locating supply caches, and finding ways around impassable areas, but it’s not a taxing game at all. It’s more about story, ambience, and exploration than any kind of challenge. Everything happens in the first-person, and I love the chunky, expressive animations of Henry’s arms and stubby, hairy legs as he scrambles up rocky cliffs, picks things up and examines them, and reclines at his desk. You never see his face, but his limbs alone have more personality than some entire characters in other games. The voice acting is fantastic too. Henry is played by Rich Sommer—Mad Men's Harry Crane, TV fans—and his performance is superbly understated and naturalistic. He has a wry, self-effacing sense of humour, and I enjoyed spending time with him. Cissy Jones, who plays Delilah, is great too, and the chemistry between the two characters is one of the highlights of the game. The way their relationship grows, and how they comfort each other at low points, is wonderfully written, even though they communicate entirely by walkie-talkie. And the dialogue is touching, but never feels cloying or forced. A joke is always waiting if things get too saccharine. But this calm can’t last forever, and it’s not long before your daily routine is interrupted. A series of strange events, including a brief glimpse of a shadowy figure in the woods, sets a mystery in motion that shifts the tone of the game dramatically. What begins as a gentle David Attenborough documentary suddenly turns into an episode of Lost, and the pace gets more fraught as a result. Just as you’ve settled into the easy rhythm of Henry’s new life, you’re faced with a series of unnerving experiences, and the change is quite jarring. The mood of the forest changes too, from a safe, solitary place to somewhere where you feel like you’re being watched. I might have been imagining it, but from this point on, as I walked through the trees, I was sure I could hear the crunch of twigs behind me. Like someone was following me. The mystery (that’s as specific as I can get) is intriguing, and you become aware of how isolated Henry is, miles from any city, alone except for a voice on a walkie-talkie. It plays brilliantly to these feelings of loneliness, and Delilah becomes an emotional lifeline: for Henry and you. She’s a reassuring voice in the darkness, but the game cleverly uses this against you too. I’m being spectacularly vague here, but the game is so heavy on story that any more details would damage your experience. But here lies my biggest issue with Firewatch. The resolution to this mystery just didn’t work for me. A compelling setup gave way to a fairly rushed, unsatisfying conclusion, and I didn’t feel like Henry had gone on any meaningful journey as a character. The events that happened in the Shoshone didn’t seem to have much relevance to him personally, or even on a thematic level. Maybe I just didn’t pick up on it, but I was left with a feeling that there was more left to explore. It seemed like there was no real, meaty connecting tissue between what happened in the forest, what brought him there, and the story's conclusion. His relationship with Delilah was much more interesting to me. It’s one of the most delightful, sincere, believable relationships between two people I’ve encountered in a game. And the fact that this was achieved entirely through a walkie-talkie—without millions of dollars spent on performance capture technology—speaks volumes about how good writing, strong characterisation, and quality voice acting will always trump the most dizzyingly realistic-looking 3D models. I was sad when the game was over, mainly because I wanted to spend more time with both of them. Firewatch is a beautiful, atmospheric game with a lot of heart, and even though the ending and a few other plot points didn’t fully work for me, I immediately wanted to play it again. It tells a poignant, heartfelt story, but always knows precisely when to crack a joke. And its Wyoming wilderness is a stunning, evocative place to exist in. But most of all, it’s the characters I fell in love with. I would have liked some more time to experience Henry’s day job—you don’t do much actual fire-watching all told—but it’s a game I won’t forget in a hurry. And if you're looking for your own escape, it’s cheaper than a ticket to Wyoming.